For a while now, I have been asking my fellow sewists how they organize, categorize, and otherwise find and use their fabric treasures. There are as many methods as there are types of sewists, but maybe you can take away a hint or two on this old notion of fabric organization. Or how do I know what I have and what do I NEED to buy. For yardage, the next divide is by batiks, collection, and then by color. Logic being that some quilters like to have a batik only quilt, or one that is made up of a specific fabric vendor’s collection of fabrics that were designed to work together. And then color organizing becomes important as fabrics are chosen for a quilt based on color, value (light or darkness) and print. Maggie, our quilt tutorial queen, has a beautiful organized sewing space. She uses open wire shelving to store yardage that has been folded and secured with bolt buddies. These clips are a great alternative to securing fabric with pins. Maggie uses bolt boards they are plastic , I use comic book boards they are acid free tag board to fold the fabric around. Or you can use the ruler folding method, here is a link showing how to fold with a ruler. This method lets you choose the size you want your finished fabric to be. Maggie’s room is filled with color and inspiration, because the fabrics are all VISABLE. She also attaches a note to her mini bolt boards with the amount of yardage and other important information about that fabric. Now fat quarters – you can check out Pinterest for all the cute and clever ways that folks store fat quarters. One new (to me) way to store smaller pieces of fabric is to put the fabric in a storage container (bin, basket, box) that is the color family of the small pieces. Eureka – all the red pieces are in a red container! Some hang their yardage on clothes hangers and store in a closet. Wooden pant hangers, cedar hangers, multi level hangers. Some roll their fabric, like fabric stores do with remnant pieces. Fabric then can be stored in bins, boxes, suitcases, book cases, and even in ottomans or wardrobes. I even have a friend who stores her yarn in the sleeves of coats and suit jackets! The next issue is , it is now stored, but what do I have and where did I put it? 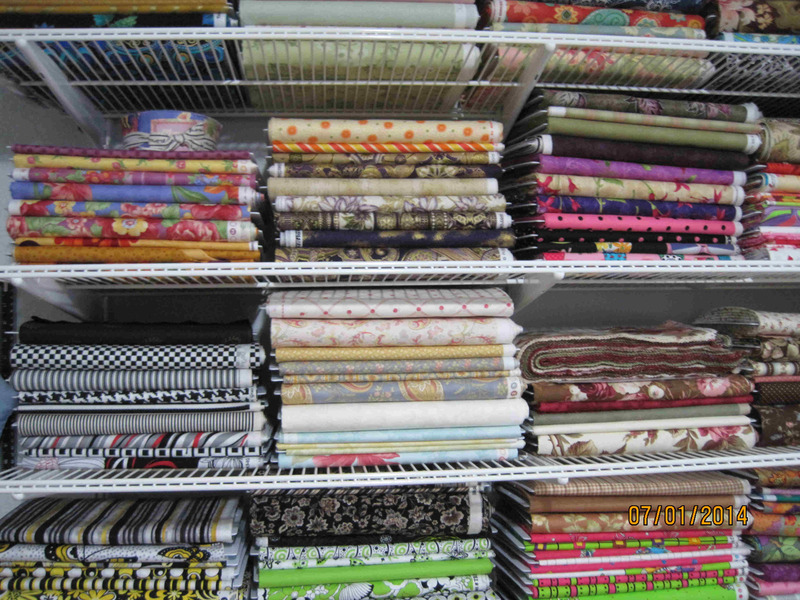 When you only have a few pieces of fabric it is no big deal – but if you have been collecting awhile. . . . . . I started out by clipping small selvages of the fabric and listing yardage and fabric type. They were organized by the label on the bin or storage box. I tried generally to organize the fabric by content or by use. It worked in theory, I could take the book with me when I went shopping for patterns, etc. I talked to other sewists who use something similar, in a file box or note card method. Documenting each fabric on a note card, then sorting the card by fabric type or use. The card would note physical location. 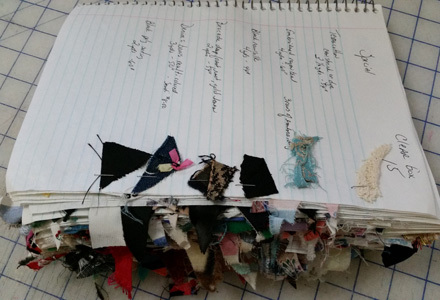 Some sewists use a spreadsheet to track fabric, threads, zippers and other notions. But, I have found a better way, at least for me. EVERNOTE ; this app is available on windows, iOS, Android, and as a web app. I had actually had the app on my phone for awhile, but wasn’t using it. Then in Austin at Pattern Review Weekend, we had an organization specialist as a speaker. She has some interesting general ideas, but the best part was when fellow sewists starting talking about their methods, and yes, Evernote to the rescue. And then just recently at the ASG conference in St. Louis, Gloria, the local president and fellow Evernote junkie, shared her templates with me. The idea behind Evernote is that each thing (a receipt, piece of paper, a note about a fabric) is a note. There isn’t the file and folder hierarchy, because you can find your notes very easily. Think about how YOU look for fabric – is it by content, color, quantity, care instruction? Figure out what about the fabric is important for you to know and that is what you should keep in the note, or the tag if you like to search that way. By default, Evernote stores notes with the newest on top, but you can search within the note text or by tags. So, here is the process I use: I created a template folder in Evernote (using Gloria’s templates). For a new fabric, I copy the the fabric template into a new note in the folder I call fabric. I would randomly type in info, before I learned more uniform template way 😉 I may type in several written descriptions, before using my ipad or my phone to snap a photo of the fabric that is stored as part of that note. If I am shopping in a brick and mortar store, I also snap a photo with my phone of the content info on the bolt end. No more mystery content fabric! Ok, yes the fabric note you see below is mystery fabric. But I know you are jealous that I bought 7 1/4 yards of fabric for $5.00! And you might have noticed that I haven’t put in an actual physical location – working on that part of my sewing room. I selected white as a tag, but that is the way my mind works. 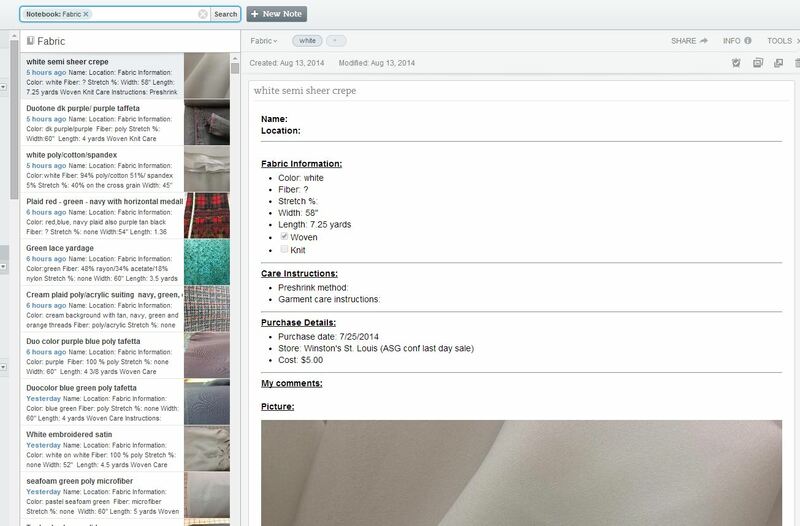 Notice on the right hand side, thumbnails of information is there to quickly visually see the fabric. These thumbnails are available on my phone, my ipad, my desktop, and via the web. My entire stash is at my fingertips. Or it will be when I am finished organizing it! Pick up a tip or two? I hope so. If you are local, I am presenting technology and sewing on Saturday, Aug 23rd at Christ United Methodist Church, SW Corner of Coit & Parker, Room 211. 10 am – noon. Coming soon in a blog on organizing will be a discussion of patterns and projects. I would love to see your comments with other great fabric organizing ideas. Thanks to all who contributed to this blog. You have all contributed to organizing me and my stash. Great article! Will need to download Evernote!